It’s not the most glamorous of online tools. The results are hard to navigate and the citations can be hard to find in the catalog. That being said, I want to give light and love to the little index that could, the Biography Index. 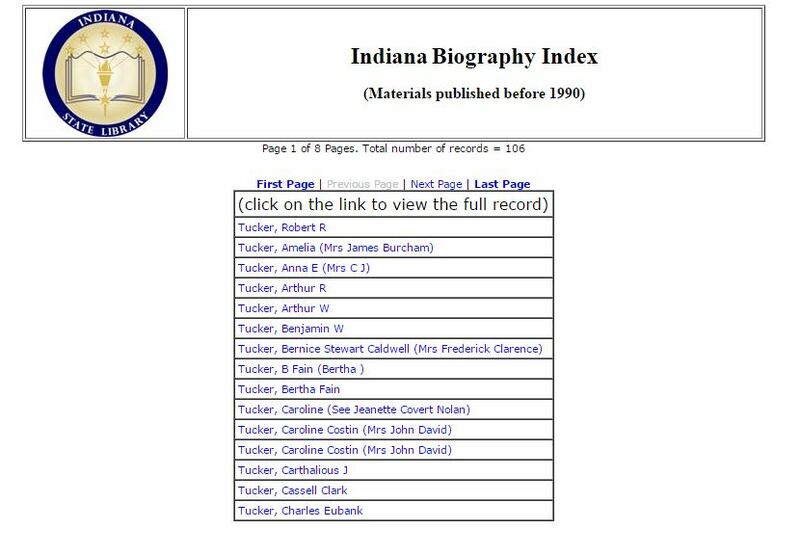 The Biography Index was created by librarians over the years. The card file lives in the catalog drawers in ISL’s Great Hall. They were digitized and put into a database some time ago. When the database was created they did not, for whatever reason, include the first name of subject. If you search for a Johnson or Smith, you will get a huge list of results look through. It’s a work in progress, but we are working on entering the first names. If you are familiar with the resource I hope you will notice the improvements. The results will point users to items at the State Library containing a bit of biographical information on that Hoosier. Whether you are looking for a legislator or a long lost uncle, this tool is a great entry point to our collection. Let’s use Bernice Tucker as an example. Clicking on her name in the results will display the card with more details. Nice to meet you Bernice!